At Malton Campus, we conducted a Career Fair with Compass Group for our Food Service Worker graduates. There were positions available, so they came to interview our graduates for both full-time and part-time Dietary Aide positions across the Greater Toronto Area. We were pleased with the results, as 22 students attended the event! And even more, we were thrilled that out of the 22 students, Compass Group has shortlisted 9 for a second round of interviews, and selected another 8 students for practicum placements! Students received panel interviews in our boardroom with 2 delegates from Compass group, their District Manager and Talent Acquisition Specialist. Compass Group Canada is the leading food service and support services company in Canada with over 25,000 associates and $1.45 billion in revenues. Their vision for growth and success is a powerful one, to combine fresh ideas with the industry's greatest talent -- Great People, Great Service, Great Results! The associates impact the lives of millions of people across Canada each year by serving delicious, nutritious meals and by providing cleaning and maintenance services in a variety of key markets including education, healthcare, business and industry, sports and leisure, and defense, offshore and remote sites. Their parent company is UK-based Compass Group PLC which operates in 50 countries, with leading market positions in the UK, Continental Europe, Australia, and the US, combined with business in developing markets in Eastern Europe, South America, and Asia. Compass Group employs more than 500,000 associates worldwide delivering service with highest customer experience. They have headquarters are in Mississauga, Ontario with regional offices in British Columbia, Alberta, Saskatchewan, Manitoba, Quebec, and Nova Scotia. While Compass Group was here, we also asked them to address our in-class students, who can be their potential applicants as soon as they finish their FSW diplomas. 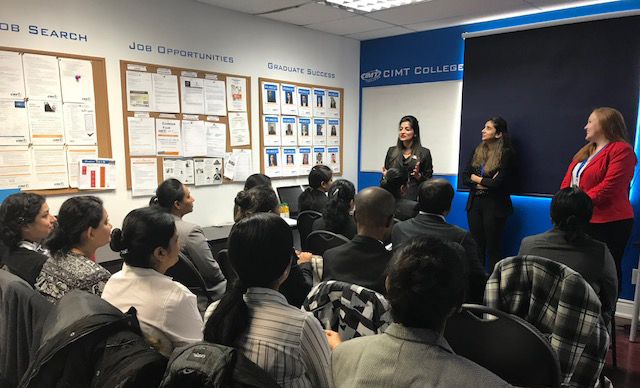 Our FSW program includes Practicum experience, so having Compass Group as one of our value chain partners for our students to attend practicums is truly important to CIMT College. It is our pleasure to work with companies like Compass Group to help students turn their dream of education into the reality of employment!